Improving the quality of life and work for low-income families through donated vehicles Marty Schwartz is the president, CEO, and founder of Vehicles for Change. 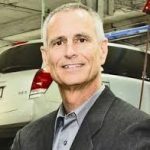 Established in 1999, Vehicles for Change provides low-income families with donated, renovated cars, as well as technical training for jobs in the automotive industry. The organization has awarded nearly 5,000 cars thus far, for a net impact of 16,450 lives improved. As a result of their involvement in the program, VFC recipient families earn better jobs and higher earnings, along with an average reduction of 90 minutes in daily commuting time. EDWIN WARFIELD: Can you tell us about your background and how Vehicles for Change started? MARTY SCHWARTZ: I was born and raised in Catonsville. I went to Cardinal Gibbons High School and University of Maryland. I have an undergrad in accounting, and my masters is in information systems and design. I started Vehicles for Change back in 1999 actually as part of a for-profit company that wanted to build a nonprofit organization. It was a company called Precision CertiPro, which was an auto parts distributor. They wanted to build a nonprofit to give back to the community, and also wanted to use that to help build their business. Through some conversations we started Vehicles for Change as that program. So, Vehicles for Change was launched in 1999. Our first county that we did cars was in Carroll County, Maryland in conjunction with the Carroll County Department of Social Services. We’re a social enterprise. We have a used car lot. We sell cars to the general public. Our lot is over in the Arbutus area on Washington Boulevard, which is where our entire location is. We do now about $1.2 million in car sales of our used car lot. And then our families pay a minimal fee for their car, so our families pay an average of about $750–800 for their vehicle, and then the balance of the funding comes from grant funding. How do you get your funding? We have funding through the Able foundation, Casey foundation, the Weinberg Foundation… Oh gosh, a variety of foundations in the Baltimore Maryland area. We also have contracts with the state of Virginia through the Department of Social Services, and in the State of Maryland through the Department of Human Resources to provide cars to families who are on what they call TANF funding. What’s the advantage of operating as a social enterprise versus a traditional nonproift? The benefits of a social enterprise are what it does for a nonprofit. Number one, it gives you control over your revenue, whereas typically if you’re working strictly on grants, they’re typically one-year funding so you’re constantly chasing that grant dollar. With the social enterprise, we have control over the revenue, just like any other business. We have a used car lot where we’re selling cars. We buy some cars at auction. Most of our cars are through donations. It also gives us an unrestricted source of revenue. So, where typically grants are tied to a specific action by the organization, our funding from our used car lot provides funding for increased staff, if we want to use it. We can use it too for our own expansion. We use it to build our cash reserve, so it gives us that unrestricted funding that allows us to be a little bit more liberal with how we use those dollars. Could you tell us more about the used car operation? Freedom Wheels is a wholly-owned subsidiary of Vehicles for Change, and it falls under the nonprofit. It’s very much like a goodwill store. About 98% of the cars that we sell through Freedom Wheels are cars that were donated. Typically they’re luxury cars—BMWs, Cadillacs, Acuras, and such that we don’t award that vehicle to a family because the cost of repairs is just way too high. So the best use of that vehicle for us is to put it on the used car lot. It also gives our donor the highest tax deductions because we might sell a car that’s going to sell in our used car lot for $6,000—it would sell at auction for $3,500, so we’re able to give our donor a much better tax deduction, and of course it generates almost twice the amount of revenue for the organization. Also, we sell a number of cars on our used car lot through Freedom Wheels that are $2,500–3,500 cars, so it really gives us the opportunity to help some low-income families that don’t qualify for the Vehicles for Change program. You know, maybe they make a little bit too much money, and they didn’t come to a sponsoring organization that we work with and so we’re able to sell them a car through our used car lot. What we’ll do with some of those folks is we’ll provide them with a loan through the organization, so that they don’t necessarily have to go through a bank, which most of them wouldn’t qualify for. I love taking things from building them from the ground-up and so the exciting thing about Vehicles for Change is we’re constantly changing as well. It’s exciting and it’s really a great place to be.